The latest quarterly results for Barnes & Noble are a mixed bag of good and bad news, but at least it shows there may be some hope. Barnes & Noble has struggled against the relentless onslaught of Amazon, and while other brick & mortar booksellers have passed on, this one has been able to withstand the storm. For the first quater of 2013 fiscal year, the book seller had a loss of $41 million, but this actually represented a decline from the $57 million loss it had in the same quarter last year. While a loss is still a loss, being able to shave it by that much in these circumstances is still a pretty good sign. The Nook business, however, had issues in the form of declining hardware sales, but an increase in digital goods. For the quarter, the Nook business accounted for $192 million in revenue, up from $191 million year over year. While Barnes & Noble didn't break the dollar amounts down by hardware and digital goods, it did indicate that the sales of apps, ebooks and its digital newsstand increased by 46 percent. The company stated in regards to this that, "device sales declined for the quarter due to lower average selling prices and production scaling issues surrounding the popular newly launched GlowLight product resulting in unmet demand." With the announcement yesterday that the Nook will be launching in the U.K. this autumn, it isn't difficult to imagine things may turn around in that department fairly soon. As for what is happening with Newco, the joint venture formed with Microsoft when a $300 million dollar investment was made, your guess is as good as ours. On April 30th, the company announced that it has formed a strategic partnership with Microsoft to form a new subsidiary, Newco, which is comprised of the company's NOOK digital and College businesses. The company continues to be actively engaged in the formation of Newco and is in the process of implementing the work necessary to complete the Microsoft transaction. The company expects the Microsoft transaction to close this Fall. While it is still a sting to take a loss, things aren't looking quite as gloomy at Barnes & Noble as they once did, but it is certainly not out of the woods yet. New York, NY (August 21, 2012)—Barnes & Noble, Inc. (NYSE: BKS) today reported sales and earnings for its fiscal 2013 first quarter ended July 28, 2012. First quarter consolidated revenues increased 2.5% to $1.5 billion as compared to the prior year. First quarter consolidated earnings before interest, taxes, depreciation and amortization (EBITDA) was $4 million as compared to a loss of $24 million a year ago. The consolidated first quarter net loss declined 28% as compared to the prior year to $41.0 million, or $0.78 per share. "During the first quarter, we continued to see improvement in both our rapidly growing NOOK business, which saw digital content sales increase 46% during the quarter, and at our bookstores, which continue to benefit from market consolidation and strong sales of the Fifty Shades series," said William Lynch, Chief Executive Officer of Barnes & Noble. "The growth in comps at retail and the continued strong growth of our digital content business, as well as increased cost management focus, were drivers in the business turning from an EBITDA loss last year to slightly positive EBITDA in the first quarter of this year. As announced yesterday, we are excited to expand our award winning NOOK digital bookstore and devices beyond the U.S. market and to work with U.K. retailers to bring millions of U.K. customers the best experience in digital reading." (1) Represents the elimination of intercompany sales from NOOK to Barnes & Noble Retail and Barnes & Noble College on a sell through basis. 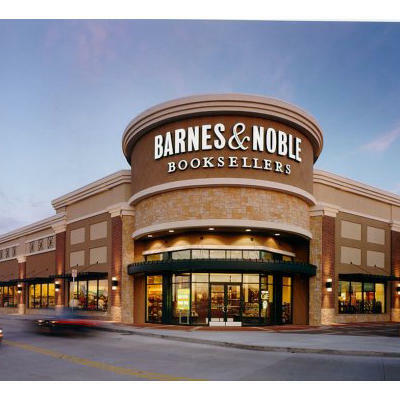 The Retail segment, which consists of the Barnes & Noble bookstores and BN.com businesses, had revenues of $1.1 billion for the quarter, increasing 2% over the prior year. Comparable bookstore sales increased 4.6% for the quarter, as compared to the prior year period. Comparable bookstore sales continued to benefit from the liquidation of Borders' bookstores in fiscal 2012 and strong sales of the Fifty Shades of Grey series. Core comparable bookstore sales, which exclude sales of NOOK products, increased 7.6% for the quarter. BN.com sales continued to decline for the quarter. Retail earnings before interest, taxes, depreciation and amortization (EBITDA) increased from $40 million to $75 million during the first quarter, an 88% increase, driven by comparable sales increases, a higher mix of higher margin core products and increased store productivity. The College segment, which consists of the Barnes & Noble College bookstores business, had revenues of $221 million during this non-back-to-school rush period. Comparable College store sales decreased 2.0% for the quarter, as compared to the prior year period. College comparable store sales reflect the retail selling price of a new or used textbook when rented, rather than solely the rental fee received and amortized over the rental period. College EBITDA losses increased by $2 million during the quarter from a loss of $12 million a year ago to a loss of $14 million, driven by new store expenses and investments in digital education. The NOOK segment, which consists of the company's digital business (including Readers, digital content and accessories), had revenues of $192 million for the quarter, essentially flat as compared to last year. Digital content sales increased 46% for the first quarter. Digital content sales are defined to include digital books, digital newsstand, and the apps business. Device sales declined for the quarter due to lower average selling prices and production scaling issues surrounding the popular newly launched GlowLight product resulting in unmet demand. NOOK EBITDA losses increased by $6 million, from a loss of $51 million to a loss of $57 million, as a result of product markdowns on the recently announced NOOK price adjustments, as well as continued investments in the NOOK business.